There are great deals, freebies and sales that you can take advantage of whether you owe taxes you're getting refund. Either way, we've got you covered. If you expect to be short on cash and too depressed to cook dinner on Monday because you had to pay taxes, you can take advantage of tax day deals at the restaurants and fast food chains we have listed below. If you think you'll be flush with cash after filing your taxes, you can scroll to the bottom to find five sales that will help you get more out of your refund. These deals will be available on Monday. Boston Market: Half chicken individual meal and drink for $10.40. Bruegger's Bagels: Sign up for Bruegger's Bagels Inner Circle, get a big bagel bundle for $10.40. BurgerFi: $4.15 cheeseburger for customers who sign up for a rewards membership in the BurgerFi app, then have the app scanned at the register when they make a purchase. California Tortilla: Free chips and quest with any purchase when you say "1040" while ordering. 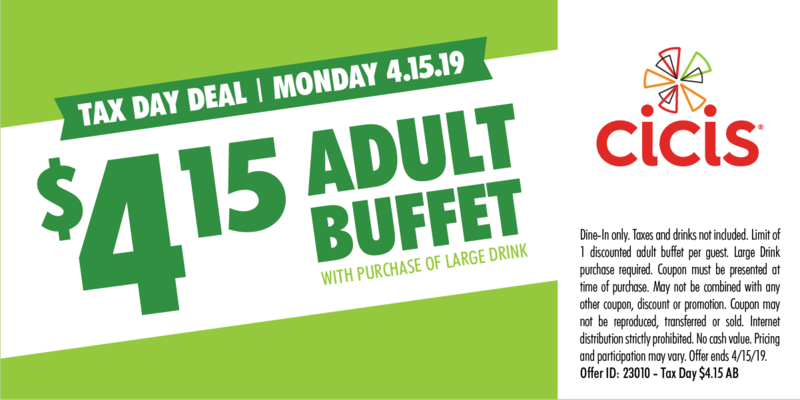 Cicis Pizza: $4.15 adult buffet, dine-in only with this coupon. 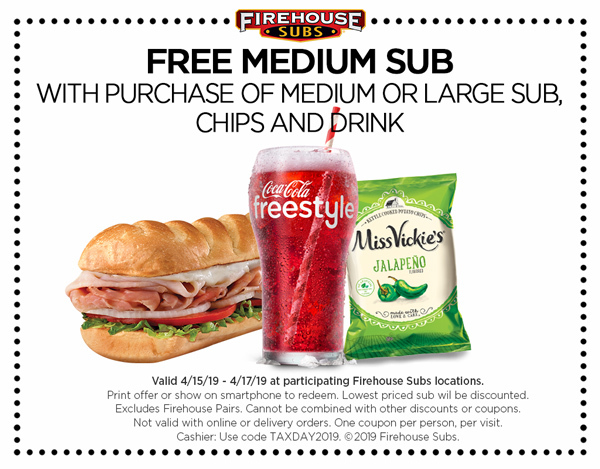 Firehouse Subs: Free medium sub with this coupon and the purchase of a medium or large sub, chips and drink. Great American Cookies: Free chocolate chip cookie. Hardee's: Free sausage biscuit from 7-10 a.m. when you say "made from scratch" while ordering. Hot Dog on a Stick: Free turkey or veggies dog at participating locations. Schlotzsky's: Get a free small original sandwich when you buy a medium drink and chips. Lenovo 8GB RAM IdeaPad laptop (was $539.99, now $339.99): With high-end features like Dolby Audio, a very generous 128GB solid state drive and a truly surprising 8GB of RAM, this laptop is a great deal for students, small business owners and anyone on the go. ANTOP indoor HDTV antenna (was $34.99, now $16.99): This antenna is sleek and compact, measuring in at only .02 inches thick. That means you can easily place it on a wall or window and get high-definition TV for free. IdeaUSA headphones (save up to $100): You don't need to spend $300 to get great headphones! Headphones that matched or outperformed competing models by Bose and Beats by Dre are on sale right now for one-third of the price. Bibb weighted blankets (save $40 or more): How did you sleep last night? If you're in need of more restful sleep, you'll want to check out this sale on weighted blankets. Cast iron cookware set (was $99.99, now $49.99): It's rare to spend $50 on a cookware set with the knowledge it could last a lifetime. Cast iron sets are capable of that while imparting incredible flavor in to your food. You can get a three-piece set now for $50 through this sale.